This delicious blood orange olive oil cake couldn’t be simpler to make – ideal for those days when you’re short on time but still want to bake something special. Even though the blood orange season is just about over, I just couldn’t resist sharing this recipe with you. I’ve always been a big fan of oranges, but blood oranges are really special. Nothing quite compares to slicing one open to reveal the beautiful crimson flesh. They provide a much needed burst of vibrant colour during those dark, drab Winter months. 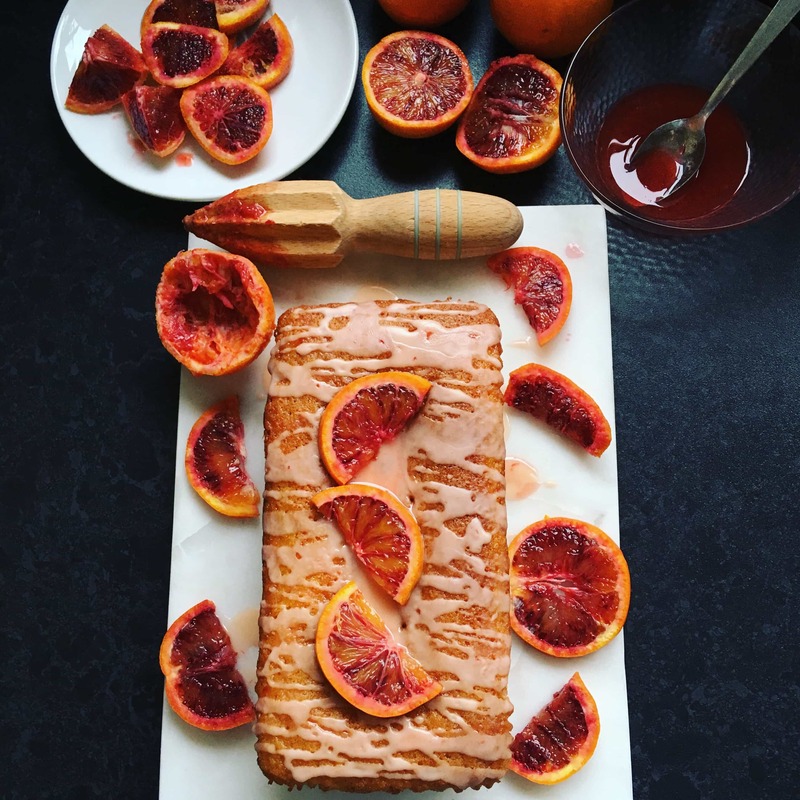 Blood oranges are very useful for a simple cake decoration – they are so naturally beautiful that a few slices on top of your cake is all you need for a simple yet stunning design. This is a really useful cake recipe to have up your sleeve. It’s nice and quick to put together – no need to get your mixer out! A whisk and a rubber spatula is all you need. If you use a gentle hand to fold in the olive oil, you’ll be rewarded with a beautifully light cake. Blood oranges are beautiful in this cake but normal oranges can easily be substituted. Pin the recipe for later! Blood oranges and olive oil are the star ingredients in this beautifully moist cake. Preheat the oven to 180C/160Fan/350F. Butter and line a 900g loaf tin. Whisk together the flour, baking powder and salt. Set aside for a moment. Place the sugar and orange zest in a medium sized bowl. Using your fingers, rub the zest into the sugar until the sugar is very aromatic. This is the best way of achieving maximum citrus flavour in your baking! Stir the yoghurt, eggs and vanilla into the zesty sugar. Whisk until everything is well blended. Whisk in the flour mixture, then using a rubber spatula, fold in the oil. The batter should be thick, smooth and a little shiny. Pour the batter into the loaf tin and bake for 45-55 minutes, or until golden and risen. A skewer inserted into the middle of the cake should come out clean. Transfer to a wire rack and cook for 10 minutes before turning out to cool completely. Simply mix the icing sugar and juice together until smooth. Drizzle over the cake and decorate with blood orange slices. Blood oranges are my favourite fruit, a pity the season they’re available here is very short. Your cake looks gorgeous. I love citrus-based cakes, and this one is a winner. Thank you! They are my favourite too. I wish they were available for longer ?